Reverend Francis Xavier Lasance (1860-1946), priest of the Archdiocese of Cincinnati, suffered from ill health and retired from parish duties in 1890 when still quite young. But what the diocese lost in pastoral labor, the nation gained in an indefatigable writer of spiritual and devotional books. He wrote 39 in all, including the New Roman Missal (1937, 1945), which remains one of the towering achievements of the pre-Vatican II period—still being sold today and very nearly a must-have reference for traditional Catholics. Much could be written about Father Lasance's literary output, but I'd like to focus here on a rather obscure artistic element of his books: the typography. Missal Initials in particular lived up to its name. It can be seen in the works of Reverends Charles Callan and John McHugh for P.J. Kenedy and Sons, including The Catholic Missal (1934) and Blessed Be God (1925). All three of these typefaces, sold and promoted by such a prominent foundry that dominated the market in its day, have since been digitized. Lasance's New Roman Missal, however, features a less common but quite distinctive set of initial capitals. 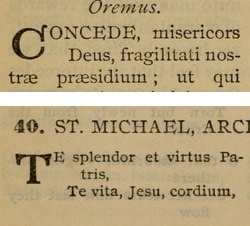 Last year it suddenly struck me that the very same initials were also present in the Manual of Prayers produced by the Third Plenary Council of Baltimore. That discovery inspired a search for further examples. They also appeared in Lasance's Prayer-book for Religious (1904), Catholic Girls' Guide (1906), Young Man's Guide (1910), and Blessed Sacrament Book (1913), among others. The latest occurrence I have found was in The Holy Bible: New American Catholic Edition (1952 and 1958 editions), produced by Lasance's publisher Benziger Brothers. This range of titles firmly established the letters' importance in American Catholic printing and piqued my curiosity about where they came from. 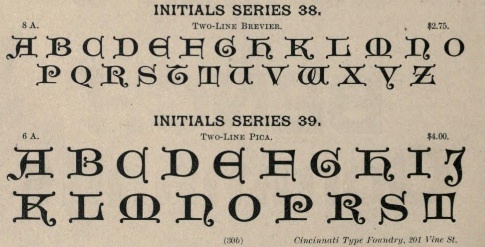 This same foundry was originally responsible for the "Cincinnati Initials" shown above; their business having been merged into the American Type Founders in 1892. 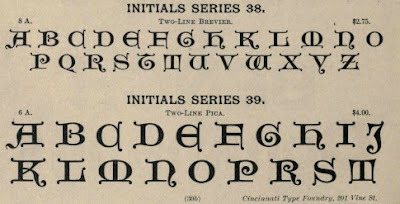 However, unlike Cincinnati Initials and the other two ATF typefaces, I have not seen any indication that Series 38 and 39 were actually sold by the ATF, and they have apparently not been digitized since. They seem to have come and gone rather quickly, remaining rather obscure to everyone except Benziger Bros., who showed an evident fondness for the typeface right up to Vatican II. There is no indication from the specimen books who designed Series 38 and 39 or what, if any, European antecedents served as models in their creation. The elegance of these capitals and their strong Catholic associations made me very eager to import them into a font creation program for design work. 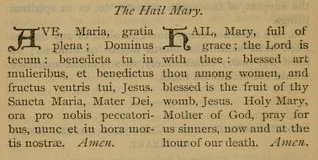 In the process, I discovered a few interesting variations peculiar to the Baltimore Manual of Prayers. Two of the letters in the Manual had been obviously modified from the Series 38 and 39 originals, presumably hand cut by the publisher to improve readability. The C had its bottom right flourish removed and a gap added to look more like a traditional printed C. And there was also a version of T stripped of all of its flourishes entirely. Overall, these Lasance initials have much to recommend them for modern use. First, most of them are generally blockish and somewhat square, so if you set them as drop caps they will nicely fill up much of the surrounding white space. Second, they tend to be more wide than tall—not a common feature in Lombardic fonts today, but hearkening back to their medieval predecessors and allowing a larger, heavier look while taking up only 2 lines of text. Finally, unlike many other modern digitized Lombardic capitals, these letters do not have very fine lines that are visually lost beside surrounding body text. The bold, thick flourishes of the Lasance initials tend to stand out very well from the rest of the printed page. As Benziger Bros. showed for over half a century, they are excellent design choices for Missals, prayer books, and Bibles. Although the United States cannot, obviously, boast of any national hands and script styles from the Middle Ages, perhaps we can consider these capitals from the Cincinnati Type Foundry an authentic native development in the genre. Prominently featured in some of the most notable Catholic publications from the late 1880s to the 1950s, they are a key part of the tradition of American ecclesiastical book art, and one well worth restoring. 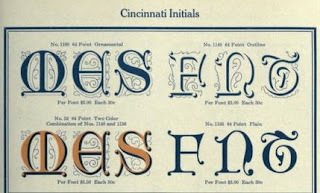 A digitized version of Lasance Initials is available in the Fonts section at www.ancillapress.com.